Is that a banana, or you just happy to see me? that man looks way toooo happy. …Does whatever a banana can? 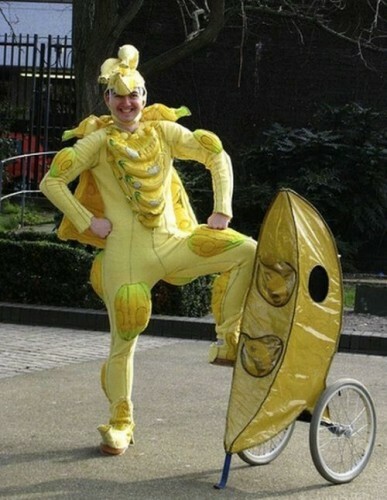 Banana man, Atheists worst nightmare? This banana is loaded, and I won’t hesitate to use it. I can’t believe no one said this yet…I get to, yay! He’s got a little cap’n in ’em. Is that not Sam Moran from the Wiggles? The cart looks like a pea pod. …wow that’s quite an impressive bunch he has. On a more realistic note, do not want. Bright yellow leotard is bright.